The RAD/RFD1-42 benchtop oven features horizontal recirculating airflow and exceptional temperature uniformity. The result is proven reliability in demanding production and laboratory applications, such as curing, drying, aging, UL testing and other process-critical applications. 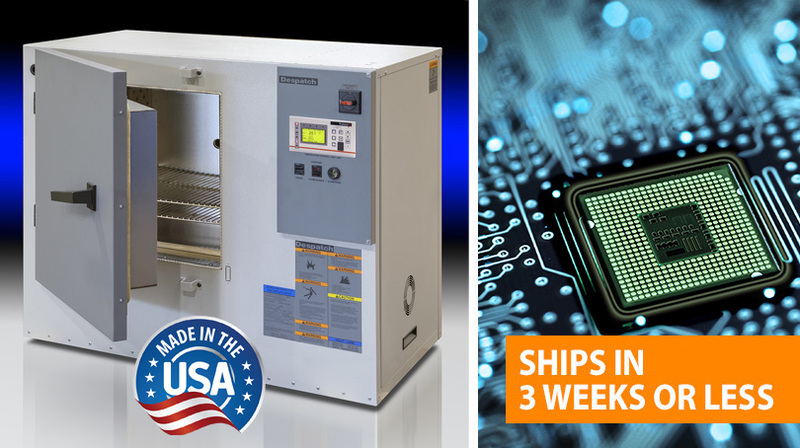 This high-performance oven delivers temperatures up to 343℃ (650℉) and has a 4.2 cu ft (117 liter) capacity perfect for small parts, small lot sizes or tight space considerations. The RF Class A version of this benchtop oven is specifically designed to meet NFPA 86 requirements for applications that include flammable solvents or large amounts of moisture removal. This Class A oven is complete with a pressure relief panel, purge timer, and exhaust fan. The RFD1-42 Class A oven is a very popular benchtop oven due to its size and capabilities. With its benchtop design and small footprint, it is ideal for small and R&D Class A applications. Despatch also offers an RAF/RFF furnace model. The furnace features temperatures of up to 538℃ (1000℉). 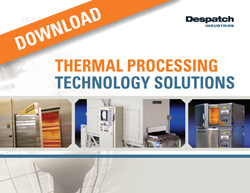 See RAF/RFF Furnace brochure for complete information. Advanced control | Protocol 3™ is a microprocessor-based temperature and hi-limit controller with large LCD display and real time clock for auto start capability. The LCD display shows temperature readings along with clear, detailed information on oven status. Protocol 3™ features three operating modes for quick and easy operation: Manual mode, Timer mode and Profile mode. The data-logging functionality enables reporting and analyzing and data files can be exported via the controller's USB port. Modbus RS485 communications are included for easy data access. Multiple temperature operations are controlled by up to eight programs, with eight ramp and soak segments in each program.